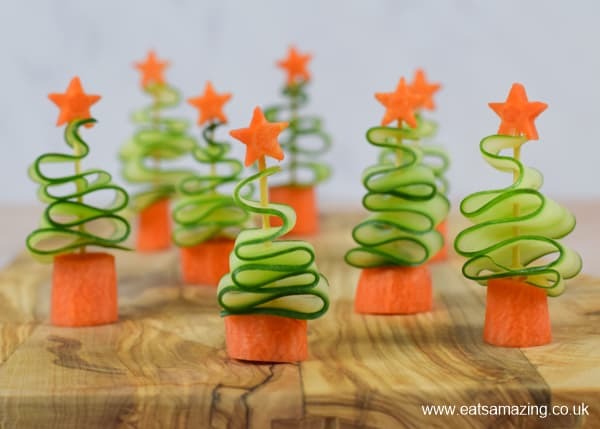 Today I’m sharing my tutorial for a super cute healthy Christmas party food idea for kids – easy cucumber Christmas trees! This healthy festive party snack may look impressive but it’s really quick and easy to make – why not let the kids have a go at making their own? I can’t believe we are a week into December already, where has this year gone?! Life has been rather manic recently, but I’ve been working on some lovely Christmas recipes and fun food ideas whenever I’ve had a chance so I will do my best share them all here before the big day arrives! 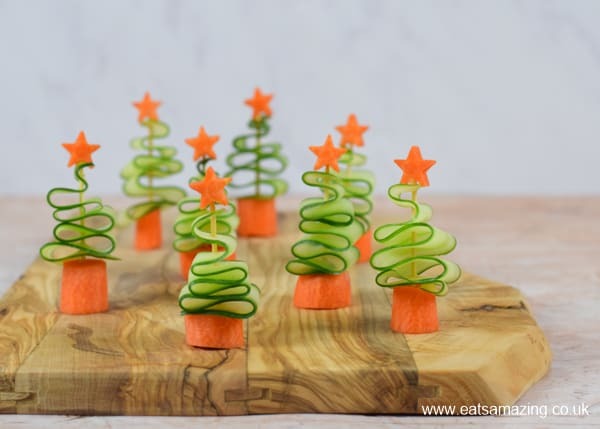 These fun vegetable Christmas trees are the first of the festive recipes I’m sharing on the blog this year, didn’t they turn out cute? 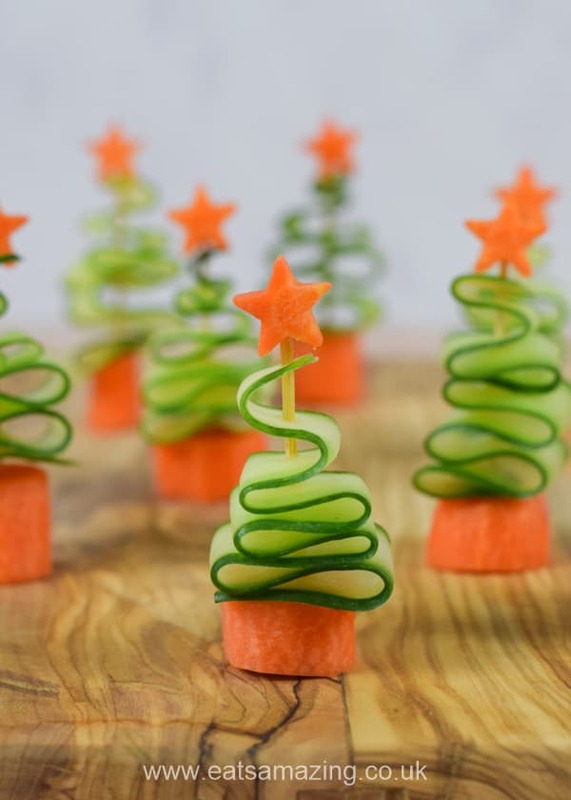 They’re made from just two ingredients – carrot and cucumber, and make a great fun alternative to plain crudites at a Christmas party! Peel the carrot, discarding the top and bottom. From the thicker end of the carrot, cut 8 rounds, around 1/2 cm thick. Using a mini star-shaped cutter, cut a star from each piece of carrot. Divide and cut the remaining piece of carrot into 8 pieces, which will form the trunks of your cucumber trees. Set the carrot stars and pieces to one side. Using a vegetable peeler, cut long strips from the cucumber, the whole length long. Starting at the smallest end, carefully fold a strip of cucumber back and forth, starting with small folds and getting gradually bigger with each one, until you have created a tree shape. Push the folds together, and push a cocktail stick through to skewer them from top to bottom. Push the cocktail stick into one of the carrot pieces, big fold side down. Push a carrot star onto the other end of the cocktail stick. Carefully separate the folds a little so that the cucumber fills the space between the two carrot pieces. Stand your edible Christmas tree on a plate or serving tray and repeat until you have made as many cucumber trees as you need. 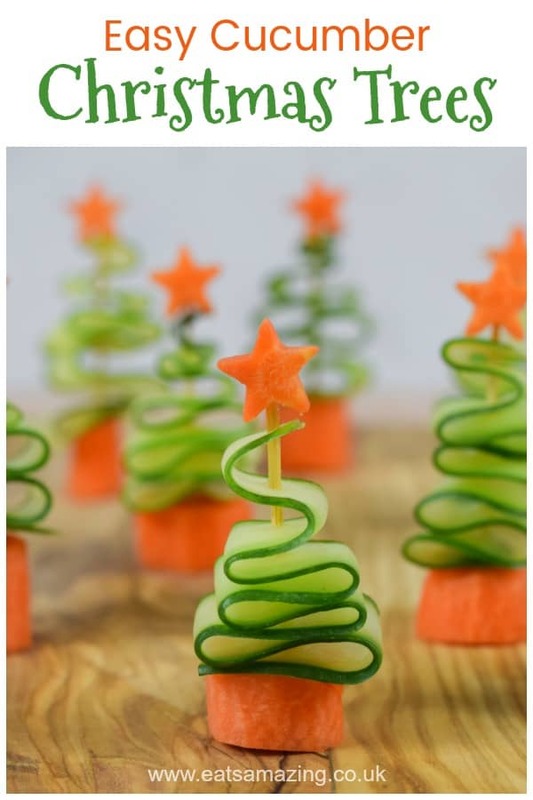 These easy cucumber Christmas trees have just 2 simple ingredients and make great fun and healthy Christmas party food for kids! I found this wonderful recipe just now. This is the cutest Christmas decoration I ever saw and which also (I’m sure) wil be appreciated next Chrsitmas in my family. THANK YOU VERY MUCH for sharing this idea. I appreciate that verz much. Thank you, I’m so glad you like the recipe!